In this road movie that feels much like classic 1970s cinema, Ben Mendelsohn (The Place Beyond the Pines, 2012) plays Gerry, a talented yet perpetually unlucky gambler who thinks the next big win is just around the corner. Gerry’s outlook changes as soon as he meets Curtis (Ryan Reynolds, Woman in Gold, 2015), a young, charming and impulsive poker player. Viewers look on as the duo become instant buddies and embark on a meandering journey gambling their way through the cornfields of Iowa down to the sticky south in New Orleans. They are willing to bet on anything, from horse races to the next guy walking out of the bathroom wearing glasses. Both men are incessantly challenged by the temptations of gambling, especially Gerry who lost his wife, daughter and essentially his life due to his addiction. The story is (very) slowly told with empathy and a bit of dry humor. Mendelsohn and Reynolds share great screen chemistry, and their characters balance each other. Gerry always appears disheveled and can barely keep his job while Curtis is the stable, dapper dresser with a voice of reason (all things considered). The film takes a while to gain some traction. Perhaps, the slow pace has to do with the dismal subject matter. The blues soundtrack livens up the film in its lowest and slowest points, but it’s not quite enough to mask the depressing storyline and overall tone in its entirety. While both men are constantly making poor decisions and struggling to stay afloat in the game of life, they are our protagonists in this film. This drama, written and directed by filmmakers Ryan Fleck and Anna Boden (It’s Kind of a Funny Story, 2010), focuses on addiction, family, regret, and the paths we must take to realize what’s truly important. During their many stops at riverboat casinos, racetracks, pool halls and pubs, Gerry and Curtis continue to find that luck isn’t in their favor. They experience major highs and ultimate lows, and it’s during this journey that their true character and motivation is revealed, forcing an undeniable relationship between the two of them. Boden and Fleck were inspired by The Gambler (1974) when creating this low-budget indie film, so they made a point to include a surprise cameo by writer and director James Toback. 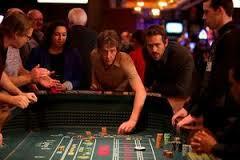 Toback has a few seconds of screen time as Tony Roundtree, the host of a high-stakes poker game. Mississippi Grind is what happens when someone has been dealt a bad hand and isn’t capable of taking his chips off of the table, despite rounds of disappointment. Bottom-Line? For an addiction drama, I would have thought the film would be just as addictive for the viewer. While Reynolds and Mendelsohn are entertaining and great fits for their roles, the narrative itself is too often grind to a halt.